Each meeting includes a one-hour skills training, followed by a one-hour mentoring roundtable, where attendees can bring up litigation questions they’re currently facing (whether related to the presentation topic or not), and get input from the group. Experienced litigators will be present during the second hour, and a light lunch will be provided. 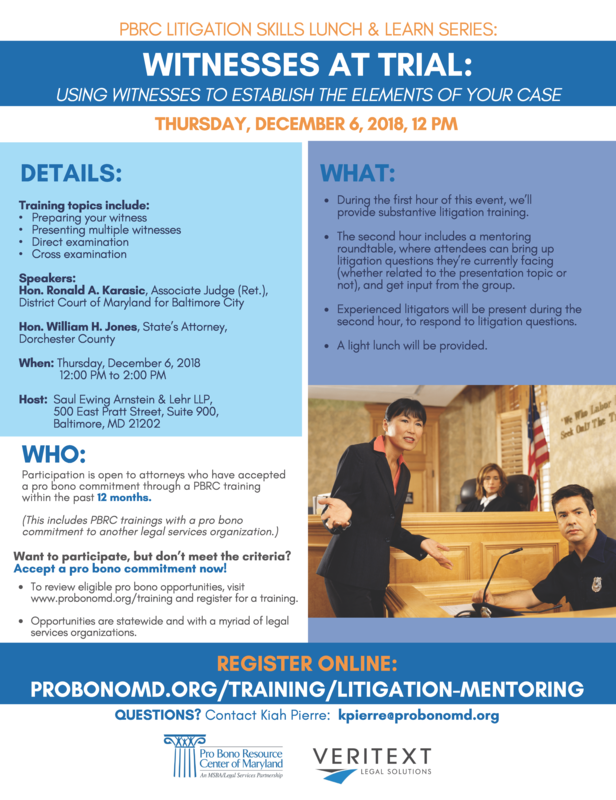 Participation is open to attorneys who have already accepted a pro bono commitment through a PBRC training within the past 12 months. If you have not accepted a pro bono commitment through a PBRC training within the past 12 months, and would like to participate, visit www.probonomd.org/training to accept a pro bono commitment through a PBRC training. Opportunities are statewide and through a myriad of legal services organizations. Questions? Contact Kiah Pierre at kpierre@probonomd.org or 443-703-3046.